My relaxation go-to is typically to watch TV. Between TV time, taking care of my daughter, and working, that leaves very little time to go on outdoor adventures! And how much does TV really clear our minds? It can sometimes stimulate us more! National relaxation day motivated me to make a change this week, and do all of my relaxing outdoors! 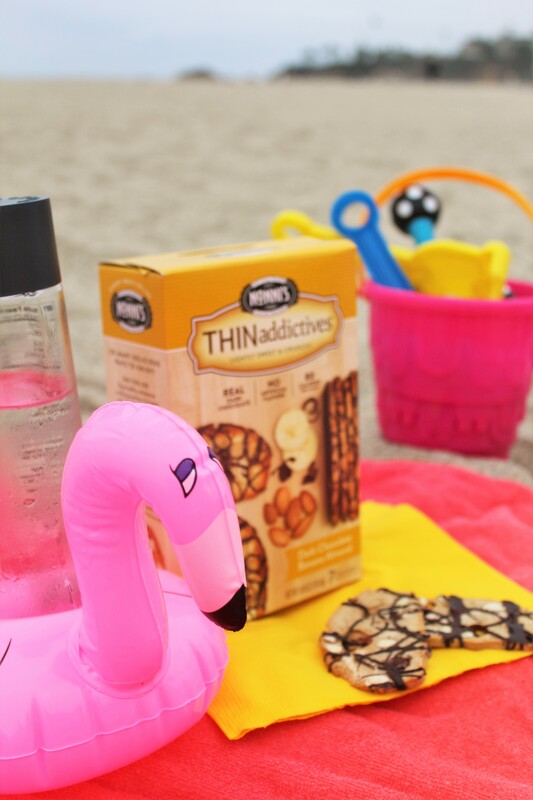 I found three different ways to relax with my whole family outside this summer, and we brought along the new Nonni THINaddictive dark chocolate biscottis along for a fun, indulgent, yet guilt-free snack! My family and I actually walk to the park everyday with our daughter and our dog, but in making a conscious effort to unwind, we realized 70% of the time we aren’t fully present. We turned our phones on airplane mode so we wouldn’t be distracted or tempted to get lost in social media. Just making that small move of going in airplane mode while watching your child play at the park was so freeing and relaxing! We got to soak in the joy of watching our daughter giggle, swing, run in the grass! Our daughter seemed to be enjoying her time more, realizing we were more present and paying more attention to her. She was wanting to hold our hand and go up on the playground equipment with her, the giggles still non-stop. She even reached out for my hand and walked over to our dog with me and was loving petting her (and our dog seemed to be on board with this, too). By making a mindful effort to live in the present, focus on just having fun (rather than toggling between park time and phone time), we were able to have a great family experience with lots of smiles! Before we left, we set up a blanket with the Nonni THINaddictives Dark Chocolate Cherry Almond biscotti, along with some cold brew (since I have a slight coffee obsession). Since the biscotti are made from all-natural ingredients and just 70 calories, we were able to eat them without feeling heavy or weighed down. It was the perfect fun treat to eat to end our park date! The tart cherries, flavorful almonds, paired with the semi-sweet dark chocolate were the perfect flavors to compliment a strong black, cold brew coffee. It definitely pleased this coffee-loving family! Although my family and I don’t have the availability to go on an overnight camping trip, twice this past week we had an hour-long campfire! Fortunately for us, nearby where we live there was a free musical story time with Magic Steps Music, complete with a fire pit, hot chocolate, and the gorgeous setting of the Laguna Beach hills. It is a kid-friendly, mini kumbaya circle! Even if there isn’t a program like this near where you live, you can make your own mini camp environment either in your backyard or at a nearby park. Take your family near sunset time, bring a guitar if you have one. Even if not, you can play some songs on your phone to sing along to, some storybooks, or just a blanket to look at the stars! We almost always end up watching TV or cleaning up the house around dusk, so it was so special to be outdoors during this beautiful time of day, and getting to have this wonderful family memory. We brought along a different flavor of Nonni, the Double Dark Chocolate Almond! We thought it would be fun to eat those as our snack with our hot chocolate for a super-chocolate-filled campfire! And since our biscotti was only 80-calories, we went for whipped cream in our hot chocolate! It’s all about balance, right? Having lived in southern California almost my whole life, I am in love with the beach. It has been the setting for many important memories and celebrations in my life. I always like to go and take long walks, and splash in the water! But this past week for national relaxation day I did something different: I laid on the beach, closed my eyes, and just listened to the waves! Playing in the water and taking long walks on the beach are relaxing too, but sometimes we just need to be still. It felt very refreshing and helped me re-charge to lay on the soft, fine sand, listening to the waves. My daughter was having a ball and being content sitting next to me making sandcastles. She’s normally quite the active wild child, but since she loves getting dirty she was having fun digging into the sand for a long time! Making that conscious effort to just enjoy sitting on the beach and watching the waves reminded me of why I love the ocean so much, and it was great to see my love being passed down to my daughter as well. For my more beach-inspired all-natural treat for my outdoor relaxation trip I brought along the Dark Chocolate Banana Almond Nonni THINaddictives biscotti, with a sparkling water. They had lots of banana flavor packed inside, and the dark chocolate tasted very rich. Since they aren’t overly sweet, the Nonni biscotti served as a perfect pick-me-up. I loved that I didn’t need to stress while having this treat, since I knew that all of the ingredients were natural. My daughter, even though she’s only 18 months old also loved them, and could easily eat them since the almond slivers were very small. If you want to enjoy some outdoor relaxation on the beach, whether it be ocean-side, lake-side, etc, I highly recommend going in the morning! We went at 8:30 am, and it was a great way to start off our day with clear and refreshed minds (and with lots of parking available). Once we decided to get outside for a change to do our relaxing, it was amazing how many memories we were able to create in just a week! We talked more, laughed more, relaxed more, and ate amazing food! Who can ask for anything more? Check out more from Nonni THINaddictives on their Twitter, Facebook, Pinterest, and Instagram! How to get your toddlers to love whole fruits and veggies, using Once Upon a Farm! The Industry Dance Academy is Doing Disney Themed Dance Camps!